Sometimes, you have just 10 minutes, or so, spare in your weekend schedule to come up with Lunch, as I had today. The lazy option, of which so many of us are guilty, is to pop a box into the microwave and ‘Hey-Presto’ BING! All done. In recent years, I’ve been coming up with new ways of providing quick healthy food for lunch. 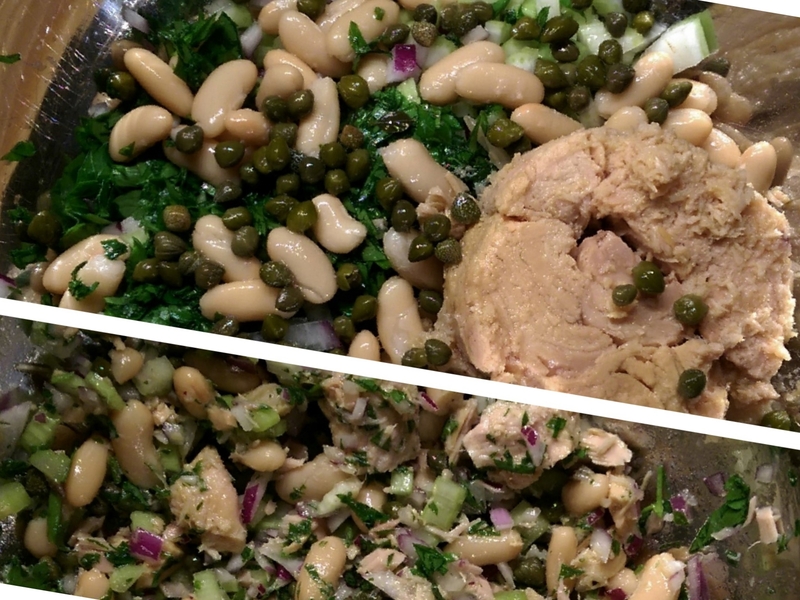 My current Summer favorite is this Tuna & Bean salad, which was inspired by a similar fabulous dish I had on the Italian Riviera. It is a great recipe, as it combines ingredients, fresh and preserved, contrasting in texture and flavor, that mix together to form a punchy light meal in around 10 minutes. 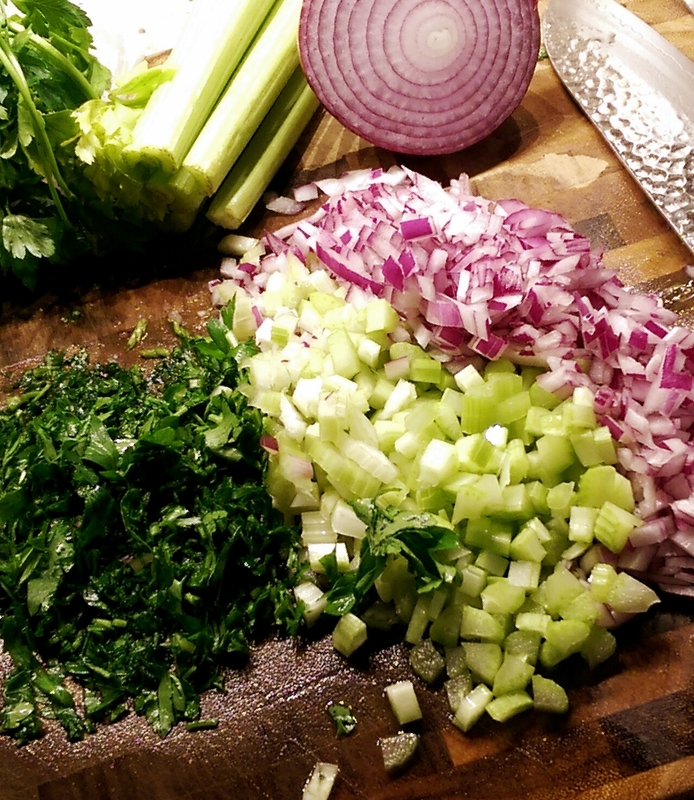 Parsley, celery, red onion chopped and ready! The juice of half a Lemon – freshly squeezed please! 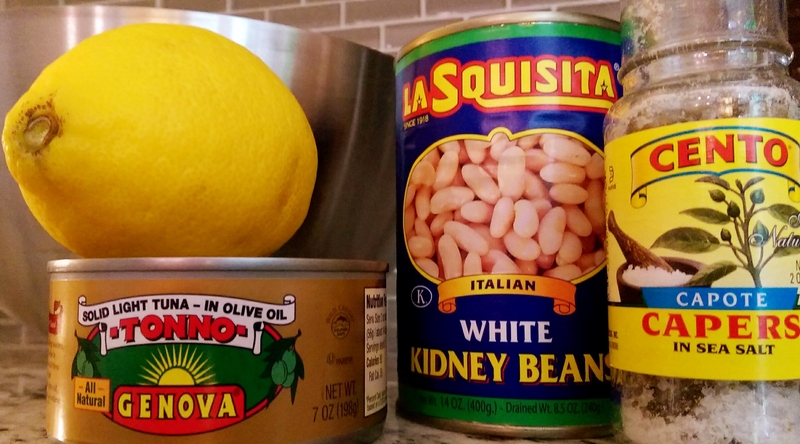 1 can of Tuna in Olive Oil. You will be using the Tuna and the oil from the can! Simply throw all the ingredients into a large bowl, mix thoroughly and voila! Within minutes you’ll be eating scrumptious, fresh, zingy, crisp, soft and healthy Italian Fast Food. Enjoy with a slice or two of warm Ciabatta bread! Nice to hear from you Simon and great to meet ya. And you too. I hope you enjoy the posts. I just uploaded a seriously yummy carrot salad. Check it out! I will do that Simon. Youll find me on Facebook by my full name Paulette Le Pore Motzko. Also on Twitter and Pinterest and Instagram by my nick name PollyMotzko. I found http://taste2taste.com at 12 place in google’s search results.